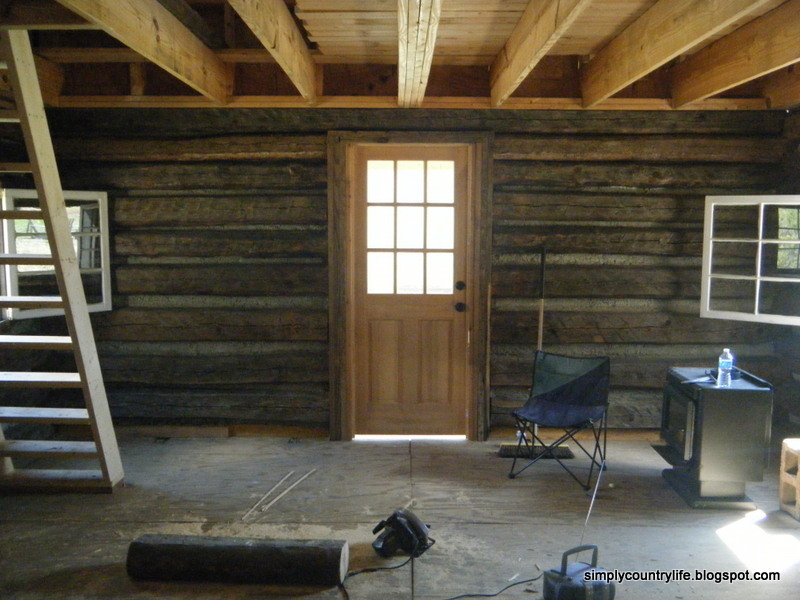 Simply Country Life: Cabin Chronicles Part 7 - Starting on the Inside! 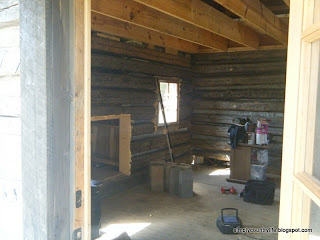 Cabin Chronicles Part 7 - Starting on the Inside! 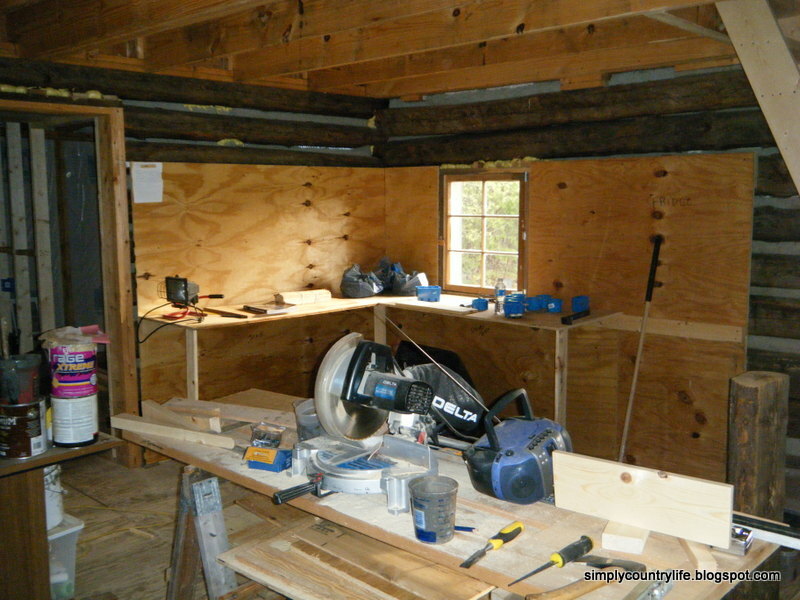 Yay - we're finally working on the inside of the cabin! We were winging the floor plan as we went, which made for a few misplaced electrical outlets, lighting fixtures and windows, but overall, everything worked out alright. We had a general idea of how we wanted to design the layout of the rooms and we just went with it. As you walk through the front door the stairs will be immediately to your right. 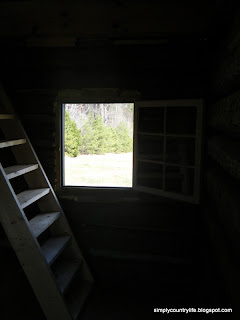 The stairs consisted of a handmade ladder through most of the construction process. 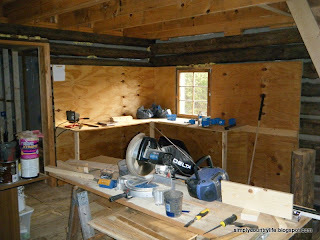 The kitchen area begins under the stairs and continues in an L shape around the back right corner. We insulated between the logs and framed this area out with plywood first. This saved us from having to chink between the logs in that area. It also provided a way to measure and mark where the stove, sink and fridge would go. 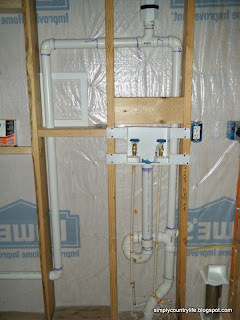 This was pertinent so that we could run the electric and plumbing to the right places. We went to Lowes and picked out an apartment size stove and a small 15 cubic foot fridge that weekend. We joked about how our Saturday night dates always consisted of a trip to Lowes. It seemed as if they knew us by name there. Anyways, we weren't ready to purchase the appliances yet because we did not have a place to store them, but we needed the dimensions to proceed with construction. Here's the rough layout of the kitchen area. 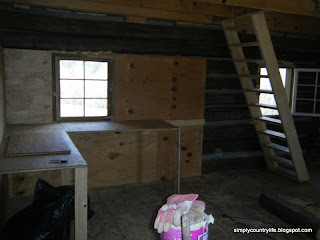 The fridge will sit under the stairs, the stove will go next to the fridge with a small counter in between them and the sink will go on the back wall. As you can see, we built temporary counters to help us with the measurements and design. We also left a few logs exposed around the top. 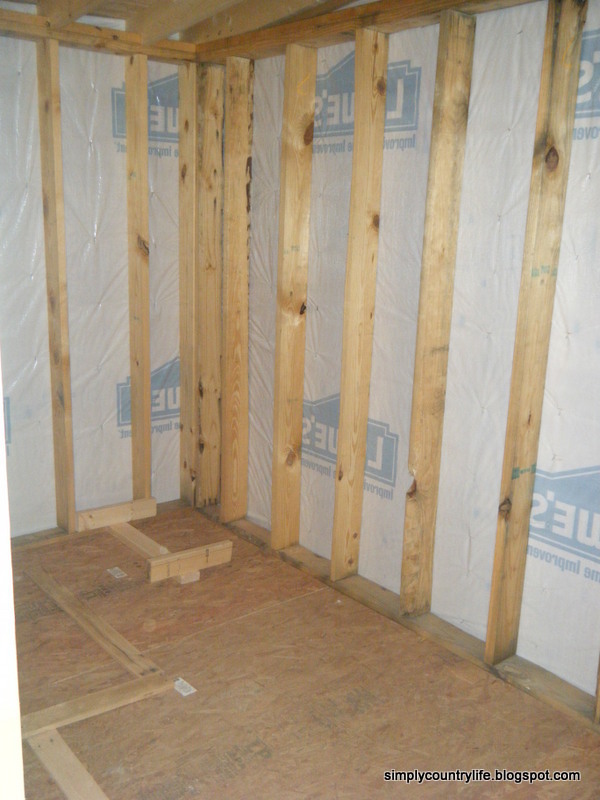 To the left of the kitchen area there is a doorway into a small hallway to access the back bedroom and bathroom. 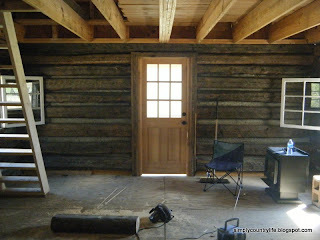 This doorway is directly across the cabin from the front door. Here's a pic standing in this back doorway looking torward the front door. 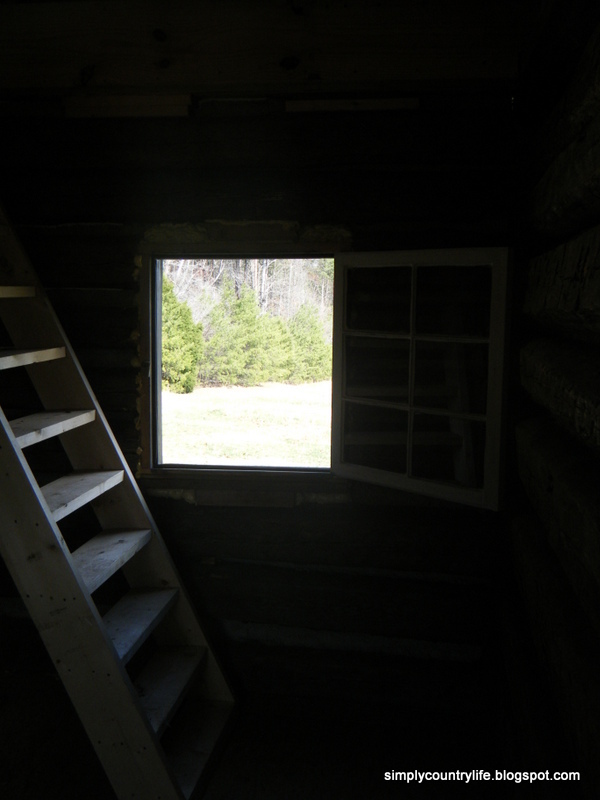 Now around to the other side of the cabin. 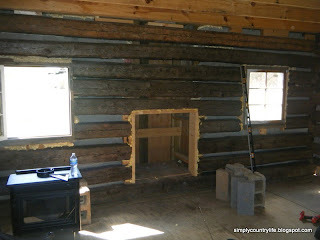 This area is to the left as you walk in the front door and it will be an open living/dining area with a fireplace in the middle of the wall. The fireplace opening is framed out in between the two windows. Through the back doorway, we created a small hallway with two doors. A small door straight ahead will lead into the bedroom and another door on the right leads into the bathroom/laundry room. Notice the boards on the floor. I used them to design the space. 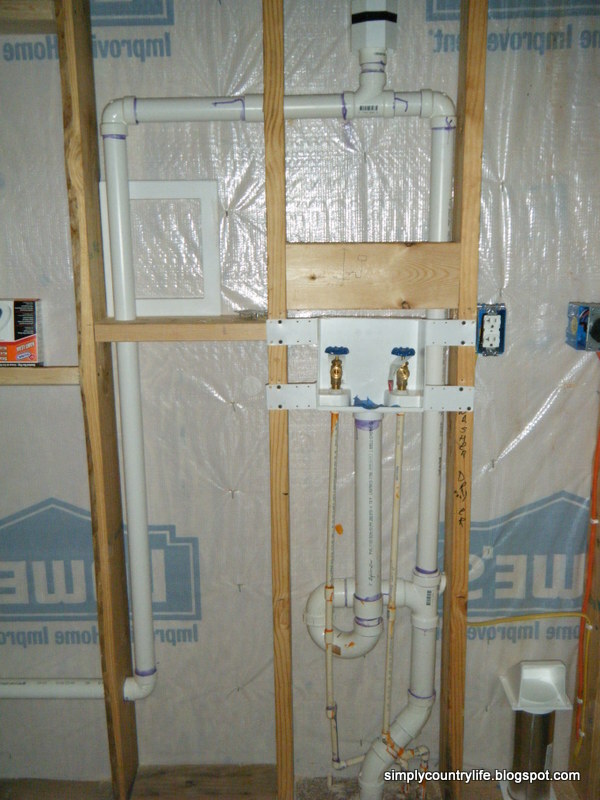 They were representative of the toilet, sink, shower and stackable washer dryer unit. Again, we had another date at Lowes to get the dimensions of everything. We decided on a 48" shower stall. We intended to go with a smaller one, but I have really long legs and didn't want to be cramped while shaving. I can't tell you how many times I rearranged this space before making a final decision on the placement of everything. The bathroom is roughly 6 feet across by 12 feet deep. 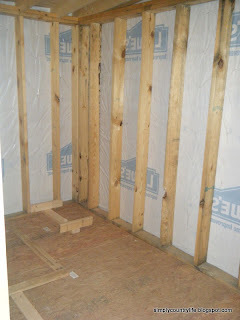 We decided to place the 4 foot shower along the back 6 foot wall and create a small closet area with the remaining space. You've got to love closet space, even if it is small. This closet is accessible from the bedroom side. The toilet and sink are directly across from each other in the middle of the room and the stackable washer dryer unit is in the corner opposite of the shower, right in front of the door. 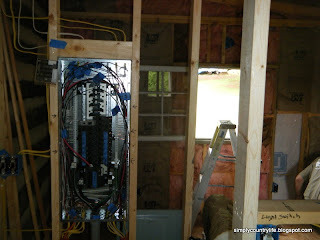 Now that we know where everything is going we can begin to run the electric and plumbing. We are blessed with wonderful neighbors and have one who happens to be a retired electrical engineer. He helped a lot with the plumbing and electric. He also helped a lot with passing the inspections too! Here's a few pics of the electric and plumbing phase. Check back next week, the upstairs floor is next and it was a real challenge. 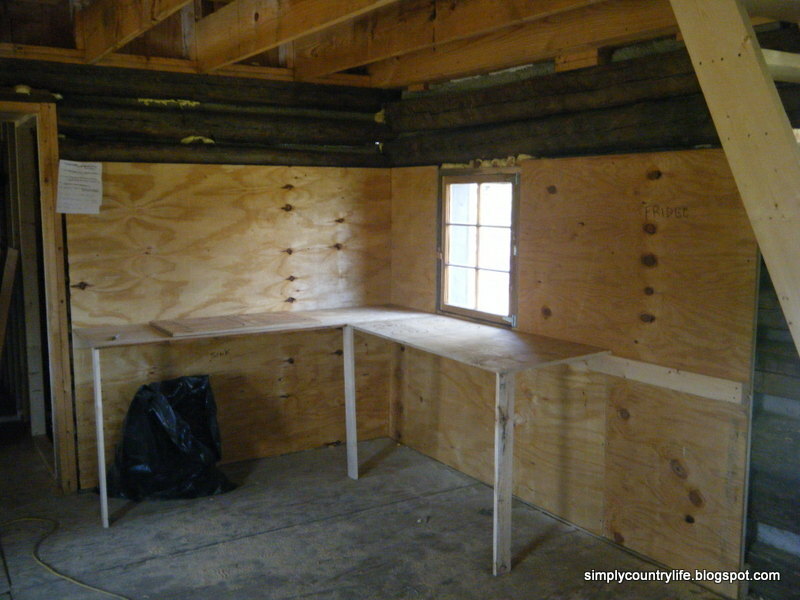 You can see how we made it from 2x4 lumber. If you've missed any of the construction up to this point, you can start from the beginning HERE.